Thanks to everyone who entered to win our Prestiche bath and body gift box! Congrats to our winner Muhajirah Wafaa! This week's giveaway is sponsored by Glossy Box. 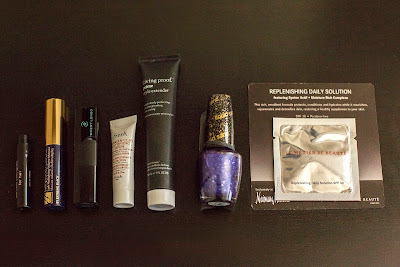 Up until recently I had never heard of Glossy Box, but now I love it! 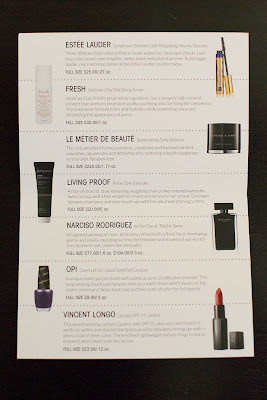 Once you subscribe, each month Glossy Box will send you a cute box with 5 travel size beauty products for you to try. It's an easy way to sample luxury/up and coming beauty products, delivered right to your house! It's a genius idea, and you should check them out. Glossy Box is giving away a free three month subscription (valued at $60). Here is an example of the box that I got from them. It comes with 5 products plus a sheet explaining what each one does. They are nice and expensive products, too. 1-Follow Hair and Makeup by Steph on YouTube. 2-Like Glossy Box on Facebook. 3-Leave a comment on this blog post with your first and last name. Contest ends on Wednesday March 20th at midnight.